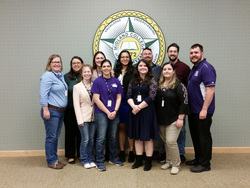 Students and faculty from the SFA Department of Chemistry and Biochemistry attended the Texas Academy of Science's 121st annual meeting at Midland College. Front row, from left: Lillie Zech of Jacksonville, Alabama; Celeste Keith of Santa Fe; Lindsey Ohmstede of Coppell; and Alexandria Cook of Aledo. Back row, from left: Dr. Alyx Frantzen, associate professor; Sydney Thompson of Murphy; Amanda Raley of Plano; Darean Bague of Killeen; Tony Trevino of Killeen; Russell Stager of Wills Point; and Dr. Brian Barngrover, assistant professor. NACOGDOCHES, Texas - Students from Stephen F. Austin State University's Department of Chemistry and Biochemistry recently received top honors at the Texas Academy of Science 121st annual meeting at Midland College. Ten students from the department attended, presenting research and sitting in on lectures. Sydney Thompson, senior biochemistry major from Murphy, received Top Oral Presentation in the chemistry and biochemistry category for her presentation about East Texas regional fuel models. Graduate student Darean Bague from Killeen was selected to participate in an oral presentation competition for graduate students. "I'm proud to be able to represent SFA at conferences such as these and really show the region how bright Lumberjacks from the Department of Chemistry and Biochemistry can shine," Thompson said. "We have a great department with many amazing and hardworking students, and I'm very grateful to be a part of it." Dr. Alyx Frantzen, associate professor in the department, said the conference provided SFA students with an opportunity to explore the research students at other universities are conducting, as well as further develop their own presentation skills. "Students who go to conferences and present their work are representing SFA and the education and opportunities they receive while they are here," said Frantzen, former vice president of the academy and current president-elect. "We received many positive comments from faculty at other universities complementing us on how well our students performed during the conference."